NOTE: A version of this review originally appeared in Issue 2, Volume 20 (2015), of Juiced.GS, a quarterly print magazine for Apple II users. If you’ve been around videogames and computers long enough, hearing the name “Kaboom” associated with a game probably conjures thoughts of Activision’s classic bomb catching game, KABOOM! (1982). 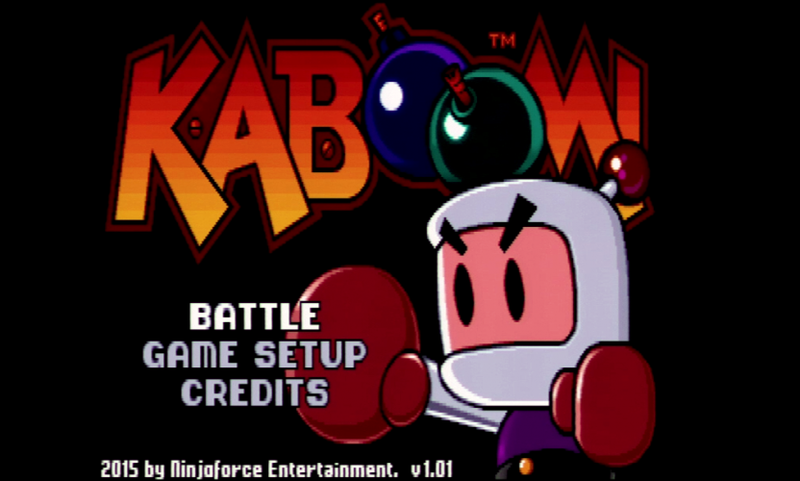 Instead, Ninjaforce Entertainment’s KABOOM! is based on the stylings of another explosive multiplatform ’80s title, the multiplayer classic, Bomberman, from Hudson Soft. In contrast to Kaboom!, where you’re tasked with using one or more buckets to catch the bombs dropped by the Mad Bomber, in KABOOM!, like Bomberman, you’re one of up to four “mad” bombers trying to bomb your way through a maze of blocks in order to blow up all of the other players before getting blown up yourself. At the beginning of each round, you and the other bomb-equipped players are placed in the corners of a maze-like battlefield that consists of two types of blocks: soft, which can be destroyed by placing bombs beside them, and solid, which are indestructible. Bombs, which have a fixed blast radius, go off shortly after being dropped, which then allows you to place another bomb. A limited number of orange-colored power-ups can be found under soft blocks and, by walking over one, can increase the number of bombs that can be dropped at once, increase a bomb’s blast radius, increase your player’s speed, allow you to pick up active bombs, or make you briefly invincible. One power-up, the skull, can cause a variety of ill effects known as “sicknesses” in the player or other players, which include decreasing run speed, setting bombs uncontrollably, or reversing controls. Sicknesses can only be cured by picking up a new power-up. Sicknesses, like other features, including team and round options, can be set in the flexible GAME SETUP menu. While a multiplayer game like this screams out for the creation of a four player joystick adapter, the fact that there are no diagonals in the game makes use of the keyboard a viable option, even when playing alone. 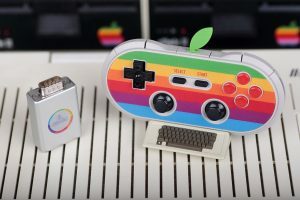 Naturally, Apple II owners are accustomed to using a keyboard for their multiplayer games, so they’re certainly as capable as any other computer owner of taking this control scheme and running with it. In fact, since the controls are expressly the four cardinal directions (plus one for dropping a bomb), it’s arguable that the keyboard is the more precise option anyway. 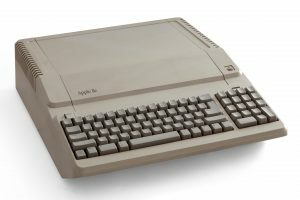 It’s also important to note that while other multiplatform games like CodeMaster’s ’90s classic, Micro Machines, have made use of a control scheme that allowed for up to four players to move their virtual vehicles by having more than one player use a single controller or keyboard, the Apple IIGS’s ability to link multiple ADB keyboards comes in particularly handy with this game. 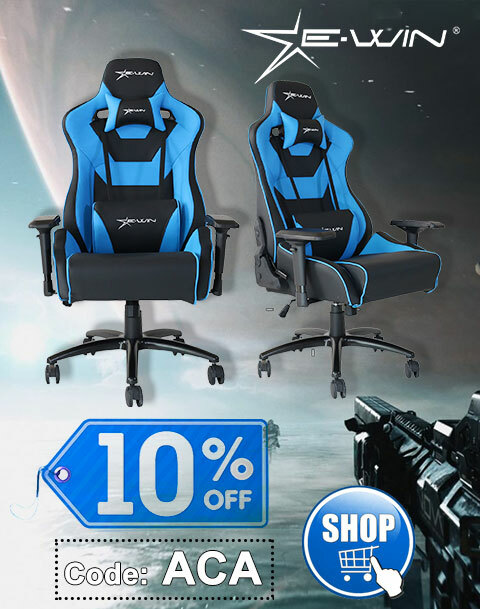 While there’s something to be said for the manic fun of four of your closest friends or family crowding around the same keyboard, it’s a great option to give one or more players the breathing room of their own dedicated control panel. Ninjaforce Entertainment set a great challenge for themselves when converting such an intense multiplayer game to the IIGS. While the audio-visuals are stellar and the available options competitive with many of the dozens of Bomberman games that are available on other platforms, the game does suffer some slowdown, particularly during multiplayer rounds with computer opponents. As such, a ZipGS or TransWarp GS accelerator is recommended, if not required, as is a stereo sound card for enhanced audio. Nevertheless, despite the periods of slowdown, occasional crash, and lack of sound card on the non-accelerated ROM1 IIGS used as the test system, gameplay and audio, the latter complete with a continuous rocking soundtrack, still proved compelling. Presently at version 1.01, KABOOM! is available for free from the Ninjaforce Website for systems running GS/OS with a minimum of 2MB of RAM, either as a single 2IMG hard drive or two disk images, the latter of which still needs to be installed on a hard disk or equivalent. The 2IMG hard drive image ran perfectly from a CFFA3000 on the 4MB test system, and was even playable through the online FTA ActiveGS Emulator found on the Website. It says a lot about how good this game is that even if it wasn’t free and so easily accessible, it would still be worth tracking down. While a multiplayer game at its heart, the robust single player options, complete with optional campaign designer where you can share your saved creations with others, makes for a compelling experience even when there’s no one else available to play against. KABOOM! is a wonderful addition to the IIGS’s software library and hopefully inspires more developers to try and bring similarly challenging game titles to the platform.